The Internet is a great place for learning new things, but it’s also a breeding ground for persistent truisms – inaccuracies repeated so often they seem true. 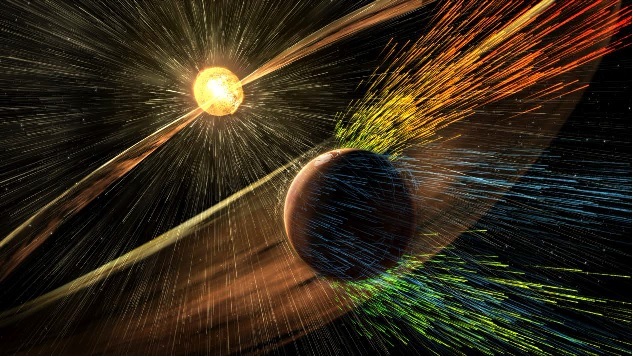 One of those truisms, heard almost every time the terraforming of Mars is discussed, is that Mars needs a magnetic field to maintain a breathable atmosphere against the steady erosive force of the Solar Wind. Discussions of terraforming then focus on exotic ideas for providing Mars with a new magnetic field. Like all persistent truisms, this one is partially true. Mars has lost substantial atmosphere over the last 4 billion years, and one of the loss processes is the interaction of the Martian atmosphere with the Solar Wind, thus the truism seems plausible. The MAVEN orbiter mission to Mars, launched in late 2013, has observed the atmospheric loss processes that have long been suspected as the causes of the loss of atmosphere from Mars. Contrary to the truism, the chief loss process is Jeans Escape – the loss of hot atoms and ions from the top of the atmosphere caused by them moving fast enough to escape Mars’ gravity. The relative contribution of the different loss processes is in the Table below. Jeans Escape of Hydrogen (H) is the dominant mass loss process. Jeans Escape happens in the very top part of an atmosphere – the Exosphere. The Exosphere where the ions, atoms and molecules no longer collide and instead follow ballistic trajectories – arcs away from the planet. Most fall back into the deeper atmosphere, but there’s a fraction that escape forever. This boiling motion of the Exosphere is energised primarily by short ultraviolet and soft x-rays from the Sun – the so-celled EUV and XUV part of the spectrum. These frequencies aren’t continuously emitted by the Sun, but come from magnetic energy “explosions” on the Sun called Solar Flares. Other Sun-like stars released more EUV & XUV when they were much younger, mostly in their first billion years of life as they converted rotational energy into electromagnetic energy. At the same time that same magnetic energy release powered a much stronger Solar Wind. The protons and other ions of the Solar Wind cause all the non-Jeans Escape processes listed in the Table above. Collectively several metres of water and perhaps 80 millibars of Carbon Dioxide would be lost over 4.2 billion years – at current rates of loss. As the bare minimum for terraforming is about ~300 millibars of carbon dioxide (equivalent to about 250 millibars of Oxygen) this doesn’t seem like a show stopper for terraforming. If we can supply modern day Mars with ~300 millibars in a few hundred years, then replacing 80 millibars in 4 billion doesn’t seem excessive. Of course the Sun has changed since its exuberant early days and the total actual loss from Mars is probably somewhere between 2 – 0.5 bars worth of atmosphere and maybe several hundred metres equivalent of water. However the Sun’s output was between 20 – 100 times higher in the very early days of its Main Sequence. This matches the apparent desiccation of Mars about ~3 billion years ago. So why does the truism persist? I suspect that most people think in verbal terms rather than quantitative terms – we know Mars is losing atmosphere due to the Solar Wind and it doesn’t have a magnetic field, so the two facts seem correlated. People who associate the two don’t take the next step of asking “How quickly is Mars losing atmosphere to the Solar Wind?” Now that the loss rate has been measured, and it’s only significant on billion year timescales, the truism should be seen for the half-truth that it actually is. Jakosky, B.M. et al “Loss of the Martian atmosphere to space: Present-day loss rates determined from MAVEN observations and integrated loss through time”, Icarus, Volume 315, 2018, Pages 146-157.